At 5:25pm, I got home from my microbiology lab course. I was exhausted and so I washed myself and prepared and ate a nice warm meal. As I was about to begin my studies, I said the name,"Muruga!" For some reason, I just happened to peer outside and to see, a huge gigantic rainbow that spanned 180 degrees across the sky. I was so happy that I immediately said,"Muruga!" I then said Sri Skanda's sacred mantra and ran outside to take a photograph of the awesome sight. When I finished taking the photo, the rainbow immediately disappeared! I didn't see it fade like rainbows normally do. It was there before I took the picture, but it immediately disappeared right after. 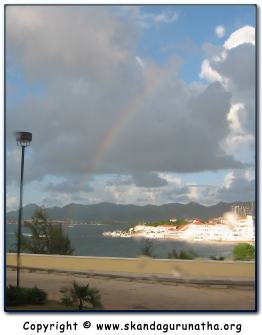 The picture above is the rainbow taken @ 5:44pm. The picture below was taken @ 5:46pm when it disappeared after I had repeated Sri Skanda's Mantra three times. For the longest time, I was really sad inside saying,"Muruga, have you forgotten me? Have I not lived up to my highest self? Why haven't you blessed me in the last few months? Have you left me? I haven't received your beautiful sign, the rainbow, in such a long time." 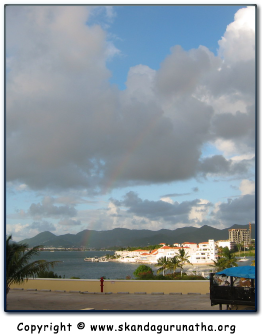 Then suddenly, a rainbow appeared and went away after I managed to take a picture of it with my camera. Thank you my Lord for showing me that "You were always there" with me. I was just ignorant and blind to see You. Thank you so much. At your fragrant feet do I pray. "We have been seemingly apart for a while, but we have not been parted, for I have been watching over you and am ever with you."